Art in November is a four-Saturday arts event taking place at the Riverside Library this fall. Organizers are actively looking for artists to participate. The entry fee is $10 for a table for a day and all sales go directly to each artist. The organizers are telling us that spaces are going fast, and if you’re interested, call Rose Caille at Riverside Library 519-255-6770 x6620. 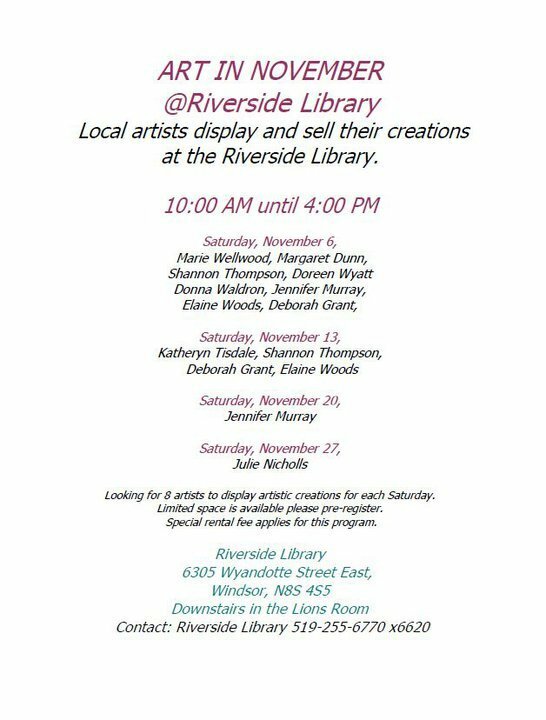 Art in November takes place on November 6th, 13th, 20th and 27th 2010 at the Riverside Library, 6305 Wyandotte Street East.